In studying terms for the parts of Greek temples, like metopes and tryglyphs, it helps to have the real thing in front of you. Since I can't offer you a Greek cruise we'll try a little visual tour. Below is a photo of the Nashville Parthenon, which is a replica of the famous Parthenon in Athens. The Athens Parthenon is in ruins, so this replica will be our stand-in. I have marked it up with a few terms. The triangular end of the roof, what we call a gable here in the U.S., is known as a pediment. It is framed by raking cornices on the top edges and a regular cornice on the bottom. The open area in the middle is called the tympanum. It was a little like a shadow box. In many temples the tympanum was filled with statues, either in relief, or free-standing. A cornice is that transition between the eave and the exterior wall. Greeks carved stone that projected out from the wall to help support the eave while visually softening the shadows. A raking cornice is on a slope, as on the underside of the gable eave. 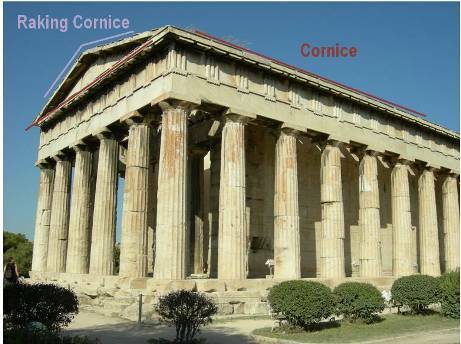 Modern cornice moldings used in houses are borrowed from the cornices used in Greek temples. 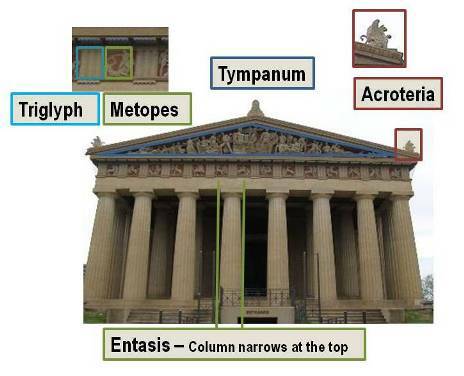 Since the Parthenon was of the Doric order I have highlighted two decorations distinct to the Doric, trigplyphs and metopes. On the top and at the corners are statues on the roof, known as acroteria. The triglyphs, three vertical bars grouped together, are repeated all the way around the temple on the area known as the frieze. Early temples had wood beams that protruded through at this point. Triglyphs represent the beams, even though the wood was replaced with stone. Actually there are beams behind the frieze, either stone or wood, supporting the roof. The metopes were carved stone slabs fitted in between the triglyphs. A pediment can also free-standing projection above a roof line. In baroque architecture it more likely to be curved than straight sided, but still in the general shape of a triangle, as in this example from a church in Querétaro, Mexico. It need not cover the width of the building. I have drawn a couple of lines next to the columns to demonstrate that these are not simple cylinders. The columns actually gets narrower towards the top, an affect known as entasis. In some temples they also get a little fatter in the middle. Three reasons are usually given for this. One, a straight cylinder would appear to get narrower in the middle. Two, nature designs her trees this way. Three, the columns were most likely to buckle in the middle, so this is where they needed to be wider. I think the first reason is correct because the Greeks had a few similar tricks. The columns on the outside leaned in towards the center and towards the middle, and the platforms upon which they were built were actually a little elevated in the center. A perfectly flat platform would appear to sag in the middle. The Temple below is the Temple of Hephaestos. It stands next to the Parthenon, but its in a little better shape. Here we see the triglyphs again, but the metopes are missing, as are all the statues in the tympanum.